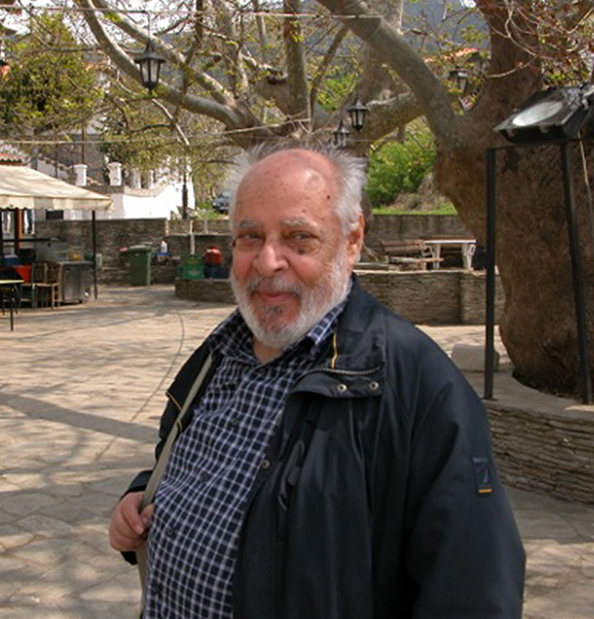 Georgos I. Despinis, professor emeritus at the Aristotle University of Thessaloniki and distinguished scholar of Greek sculpture, lost his battle with cancer on 13 September 2014. He was 78. Born on Tenos, he grew up inspired by the work of sculptors on this marble-rich island. Despinis made many important discoveries that resulted from his deep knowledge of marble and the manner of working it. His understanding of ancient sculpture was combined with an unusually visual memory and a clear sense of sculptural forms. He was a very warm person who conveyed a passionate love of his subject. Despinis will long be remembered as an inspired teacher, a vibrant lecturer, an animated respondent at conferences, a prolific scholar, and a devoted friend of his many close colleagues. Despinis studied at the University of Athens, where he received his diploma in 1958. He was such an exceptional student that his professors, Nikolaos Kontoleon and Anastasios Orlandos, chose him to be the assistant for their excavations on the island of Naxos and in ancient Messene in the Peloponnese. After completing his military service, he studied in Germany (1962–1964), first at Freiburg with Walter-Herwig Schuchhardt and then at Saarbrücken with Nikolaus Himmelmann. He then returned to Greece, where he held “temporary” appointments in the National Archaeological Museum of Athens under Christos Karouzos and Semni Karouzou and in the Archaeological Museum of Piraeus. He held regular appointments with the Archaeological Service in Thessaloniki (1967–1971) and subsequently in Piraeus (1971–1972), devoting himself to the sculptural exhibitions in their museums, thereby learning a great deal about ancient Greek sculpture. In 1970, he completed his doctoral degree at the Philosophical School of the Aristotle University of Thessaloniki with a dissertation on the cult statue of Nemesis at Rhamnous in Attica. He taught at the Aristotle University of Thessaloniki from 1972 to 1984 and resigned the position to devote himself to his research and establishing his home in Athens. One of Despinis’ great gifts was the ability to visualize three-dimensional sculpture from the smallest fragments and to make joins and associations among them, as with his reconstruction of the cult statue of Nemesis at Rhamnous, which he published in a revised version one year after completing his dissertation.1 He restored this statue from fragments that were kept at Rhamnous and in the storerooms of the National Archaeological Museum of Athens, associating it with a statuary type known from a series of copies dating to the Roman period. His work became the foundation for the study of Agorakritos and the later fifth century B.C.E. Despinis played an important role as a member of the Committee for the Conservation of the Acropolis Monuments. He lent his insights on sculpture to the formulation of many museum displays, most recently to that of the Archaeological Museum of Kalymnos, which opened in 2009. In recent years, Despinis’ work was recognized by a series of major awards. In 2007, the Academy of Athens presented him with its silver medal for Letters and Arts in recognition of his important contribution to archaeological research. In 2009, the Benaki Museum honored him for his work and for his many scientific and scholarly publications. He was elected a member of the Accademia dei Lincei in Rome, of the Deutsches Archäologisches Institut, and of the Archaeological Society at Athens. Many classical archaeologists in Greece felt a close personal attachment to Despinis, who inspired devotion among his many former students and colleagues. His regular place in the library of the Deutsches Archäologisches Institut, which he occupied for 30 years, remains empty, marked by a pile of flowers. He will long be missed. Despinis, G. 1971. Συμβολὴ στὴ μελέτη τοῦ ἔργου τοῦ Ἀγορακρίτου. Athens: Hermes. Despinis, G. 1975. Ακρόλιθα. ArchDelt Demosieumata 21. Athens: Ministry of Culture. Despinis, G. 1981. “Zum Hermes von Troizen.” AM 96:237–44. Despinis, G. 1982. Παρθενώνεια. Athens: Library of the Archaeological Society. Despinis, G. 1988a. “Zur Deutung des sogenannten Protesilaos in New York.” In Kanon: Festschrift Ernst Berger zum 60. Geburtstag am 26. Februar 1988 gewidmet, edited by M. Schmidt and E. Berger, 87–90. AntK-BH 15. Basel: Vereinigung der Freunde antiker Kunst. Despinis, G. 1988b. “Η ικέτιδα Barberini.” In Acts of the 12th International Congress of Classical Archaeology, Athens, 4–10 September 1983. Vol. 3, edited by A. Ninou and E. Kypraiou, 65–9. Athens: Ministry of Culture, Archaeological Receipts Fund. Despinis, G. 1991–1992. “Επιτύμβια στήλη από το Πόρτο Ράφτη: Αποκατάσταση και σχόλια.” Εγνατία 3:7–27. Despinis, G. 1993. “Ένα σύμπλεγμα εφεδρισμού από την Τεγέα.” In Sculpture from Arcadia and Laconia: Proceedings of an International Conference Held at the American School of Classical Studies at Athens, April 10–14, 1992, edited by W.D.E. Coulson and O. Palagia, 87–97. Oxford: Oxbow. Despinis, G. 1994. “Neues zu einem alten Fund.” AM 109:173–98. Despinis, G. 1995. “Studien zur hellenistischen Plastik I: Zwei Künstlerfamilien aus Athen.” AM 110:321–72. Despinis, G. 1996. “Studien zur hellenistischen Plastik II: Statuengruppen.” AM 111:299–336. Despinis, G. 2003. Hochrelieffriese des 2. Jahrhunderts n. Chr. aus Athen. AM. Munich: Hirmer. Despinis, G. 2010a. Μεγαρικά. Megara: Municipal Library of Megara. Despinis, G. 2010b. Ἄρτεμις Βραυρωνία: Λατρευτικά ἀγάλματα καί ἀναθήματα ἀπό τά ἱερά τῆς θεᾶς στή Βραυρώνα καί τήν Ἀκρόπολη τῆς Ἀθήνας. Βιβλιοθήκη της εν Αθήναις Αρχαιολογικής Εταιρείας 268. Athens: Archaeological Society at Athens. Despinis, G. 2012. “Ακρόλιθα αγάλματα των ρωμαϊκών χρόνων.” In Kλασική παράδοση και νεωτερικά στοιχεία στην πλαστική της ρωμαϊκής Ελλάδας, Thessaloniki, 7–9 May 2009, edited by T. Stefanidou-Tiveriou, P. Karanastasi, and D. Damaskos, 19–34. Thessaloniki: University Studio Press. Despinis, G. 2013. Μικρές μελέτες για ανάγλυφα. Athens: University of Crete. Despinis, G., and N. Kaltsas, eds. 2014. Γλυπτά των αρχαϊκών χρόνων από τον 7ο αι. έως το 480 π.Χ. 2 vols. Athens: Hellenic Ministry of Culture, Archaeological Receipts Fund. Despinis, G., T. Stefanidou-Tiveriou, and E. Voutiras. 1997. Catalogue of Sculpture in the Archaeological Museum of Thessaloniki. Vol. 1. Thessaloniki: National Bank Cultural Foundation. Despinis, G., T. Stefanidou-Tiveriou, and E. Voutiras. 2003. Κατάλογος γλυπτών του Αρχαιολογικού Μουσείου Θεσσαλονίκης. Vol. 2. Thessaloniki: National Bank Cultural Foundation. Despinis, G., T. Stefanidou-Tiveriou, and E. Voutiras. 2010. Κατάλογος γλυπτών του Αρχαιολογικού Μουσείου Θεσσαλονίκης. Vol. 3. Thessaloniki: National Bank Cultural Foundation. 2. Despinis 2003, 2010a, 2013. 3. Despinis 1975, 2012, 1982. 4. See, e.g., Despinis 1995, 1996. 5. Despinis 1981, 1988a, 1988b, 1993. 8. Despinis et al. 1997, 2003, 2010. 9. Despinis and Kaltsas 2014.